Castlemaine State Festival 2013 » Cornucopia! If Castlemaine were a musical restaurant this would be it. The Opening Night of the 2013 Castlemaine State Festival brings together an abundance of music maestros, stars of song and clusters of choirs, in a restaurant setting overflowing with musical offerings. Lyttleton Street becomes an outdoor extravaganza of plenty where festival goers are seated centre stage and served a profusion of festival appetisers that spill and flow from the surrounds of the street’s extraordinary buildings. It’s a byo chair and food-to-share affair, at tables that fill the street and all enriched by a seasonal riot of Festival fare. A singing Maitre D’, her offsiders and staff, a restaurant band, a choir of hundreds will serve an audience of more than a thousand. 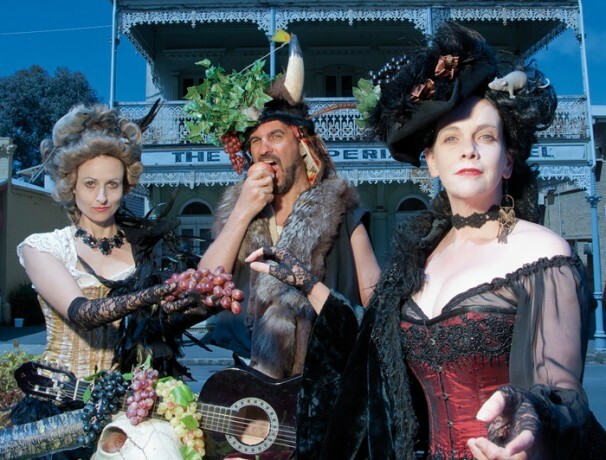 A menu du jour of Castlemaine’s minstrels and stars, opera singers and street crooners, chorists and choirs, and the hottest ‘dish’ ever to grace the verandah of Castlemaine’s iconic Imperial Hotel. Cornucopia! in song — it’s more than a mouthful of sing-a-long, it’s a feeding of the spirit. Plus members of the Chatwarblers, Acafellas, Castlemaine Singers, Castlemaine College Choir, Steiner School Choir, Maine Choir, 37 Degrees South, The Deborah Triangles, Mary Thorpe, Cyril Wong and Scott Sanders. We wish to advise that tickets for Cornucopia! will now go on sale on Thursday 17 January NOT Monday 14 January. We wish to advise that tickets will now go on sale on Thursday 17 January NOT Monday 14 January. Reservations are essential and will be available from 17 January 2013.